Hello! 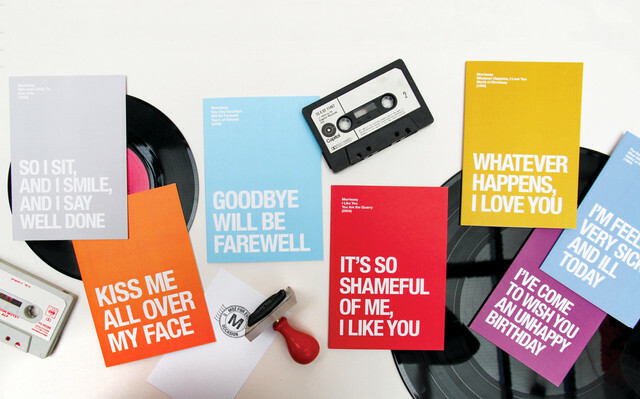 We're Moz for Every Occasion, a 100% unofficial, fan-made greetings card collection, inspired by the words of Steven Patrick Morrissey. As seen in the Manchester Evening News, all of our products are printed on sustainable source paper, are blank inside and come hand-packed with a diamond flap envelope. We deliver worldwide and welcome your enquiries on anything from postage to paper type. So email us, or if you can keep it to 140 characters, send us a tweet. You can now find our products in Blackwell's bookstore in Manchester and Mixed Up Gifts in the US.